Grass-fed on local Kentucky farms, our lamb arrives FRESH or RAW, in WholePrey™ form — a richly nourishing ratio of meat, tripe, liver, kidney and cartilage to nourish your dog naturally. 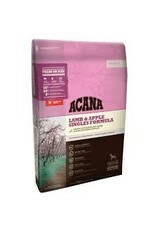 Generous infusions of freeze-dried lamb liver make ACANA the perfect choice for fussy dogs. Prepared in our Kentucky DogStar® kitchens from America’s best and freshest ingredients, ACANA Lamb & Apple is guaranteed to keep your dog healthy, happy and strong. Read our ingredients and you’ll be happy too! LIMITED INGREDIENTS SHOULDN’T MEAN LESS MEAT. Modern dogs are built like their ancestors and we believe they should eat like them, too. How do you know if your dog’s food is Biologically Appropriate™? Simple. Just answer our Biologically Appropriate™ ‘three meat questions’. 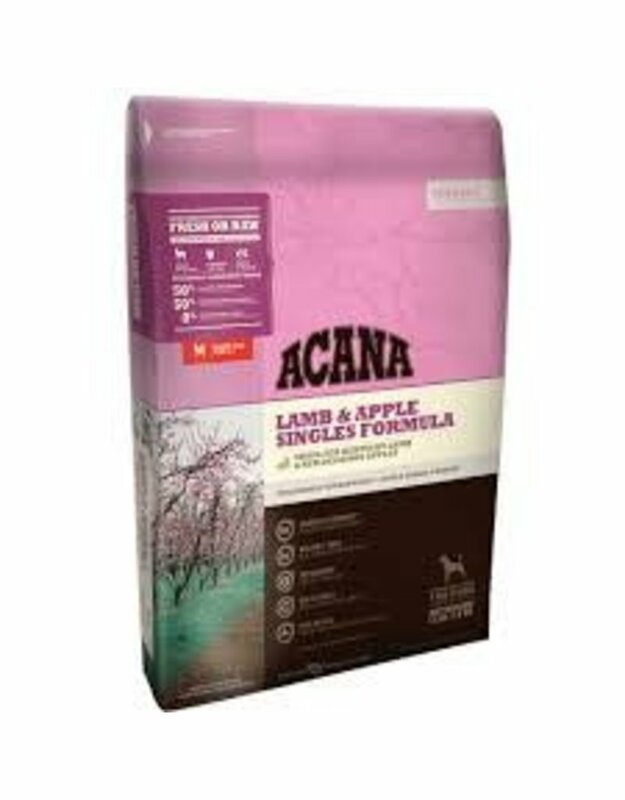 Entirely free of plant protein concentrates, ACANA Lamb & Apple is loaded with 50% lamb — up to twice as much as most limited ingredient dog foods. Plus, all our lamb is deemed fit for human consumption prior to inclusion in our foods. 1/2 of the lamb in ACANA Lamb & Apple is FRESH or RAW, supplying essential nutrients in their most nourishing form. Fresh means never frozen, so refrigeration is the only way we preserve our fresh meats, while our raw meats are flash-frozen at the source to lock in goodness. The other half is dried or oils to provide a strong and natural source of richly nourishing lamb protein and fat. ACANA Lamb & Apple features fresh and raw lamb meat, organs and cartilage in WholePrey™ ratios that supply nutrients naturally and completely. In nature there are no synthetic supplements, and dogs and wolves derive all of their nutritional needs by consuming whole prey animals. Muscle meat provides protein; liver, kidney and tripe supply vitamins and minerals; while bones and cartilage deliver calcium and phosphorus. ACANA mirrors the natural diet, applying our Meat Math and incorporating WholePrey™ meat, organs and cartilage in ratios that deliver nutrients naturally, providing a concentrated source of virtually every nutrient your dog needs to thrive, which is why virtually all of the nutrients in ACANA Lamb & Apple are naturally present, thus eliminating the need for long lists of additives. That’s why zinc is our only added supplement.